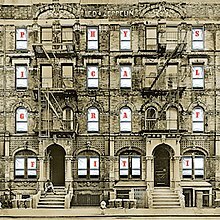 LED ZEPPELIN: PHYSICAL GRAFFITI: 1975: 5 STARS OUT OF 5 STARS: One of the great double albums of all times. Contains my favorite Zeppelin song- Kashmir. A number of different music styles on this album- the source of its greatness. I’d rank it just behind Led Zeppelin IV in the rankings of their albums. This was their peak- it was somewhat downhill after this album. 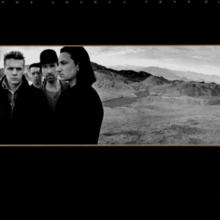 U2: THE JOSHUA TREE: 1987: 5 STARS OUT OF 5 STARS: The landmark U2 album. They were slowly building up for an explosion and this album made them at the time ‘ the greatest rock band in the world.” I saw them on that tour- and last year saw them on the 30th anniversary tour twice. One of my handful of favorite 1980’s albums- maybe my favorite if London Calling is considered 1970’s. VAN MORRISON: INTO THE MUSIC: 1979: 5 STARS OUT OF 5 STARS: My second favorite Van album behind Astral Weeks. It came out in late 1979 along with Bob Dylan’s Slow Train Coming which got ten times more publicity than this album- as brilliant as Slow Train Coming is- I like this album better- whereas Bob hits you over the head with his religious conversion- Van’s album is a lot less judgmental. AFROCUBISM: 2010: 4 STARS OUT OF 5 STARS: Grammy nominated album made of musicians from Mali and Cuba- I was wanting to listen to something a little off the map today and this fit very well. I looked at acclaimed music to see how it ranked Into The Music and Slow Train Coming for 1979- Into The Music they had at #50 for the year and Slow Train Coming didn’t make their top 70… outrageous!!! It was held against Dylan I think for becoming religious…I may be completely wrong but I do remember a lot of people being angry especially on tour when he just played his new songs…like I said I may be completely off base. I saw him in 1980- and people were booing him… it was well known what he was going to play- i don’t know why they were shocked. it was a great concert. i think you are right- i thought it was an outstanding album but it was controversial. I remember people talking about him not playing his old songs. It was a great album and like you said he wasn’t making a secret of what he was playing…That and Blood on the Tracks I loved from the seventies. Of course this was the days before the internet but as you said everyone knew he wasn’t playing the old songs. I agree Blood On The Tracks and Slow Train Coming his best 70’s stuff- I liked Desire too. … Richard was a character that is for sure. That is a funny story. I think I hit the wrong button and your comment disappeared… but i recall what you said– Infidels and Shot of Love my favorite Dylan 80’s– the mid to late 80’s were probably the worst point in his career I guess…. I loved the Jokerman video.. I got the box set Trouble No More which came out last fall covering 1979-81 i need to get that out and play it i honestly forgot i had it- must be under a pile of books!.. Neighborhood Bully another good one. Empire Burlesque wasn’t bad.